As per the BBC writeup, the Landaff Society honoured Terry Nation this week with a blue plaque for the house in Cardiff where he was born. We presume you know who he is, creator of the Daleks, Yartek, Leader of the Alien Voord, all that sort of thing. Wales Online has lots of nice pictures here. There isn't an official blue plaque system in Wales - English Heritage only handles English ones, strangely enough - so the Landaff Society (it's a suburb in Wales) seems to have done it all themsleves. It was reported earlier this year that they were hoping to get Matt Smith or someone famous like that to unveil it, but on the day, they seem to have settled for Tim Hancock, who's in charge of the Terry Nation estate. They have a short, amusingly terse biography of Nation on their website. 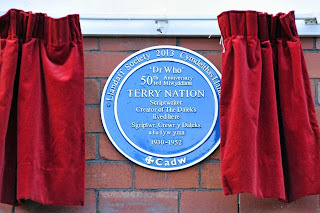 The Society chair, one Geoffrey Barton-Greenwood, postulated an amusing theory about the naming scheme Nation used for the Daleks: "There is a connection in that they are 'Daleks' and Roald 'Dahl' was only from around the corner. I think Terry Nation might well have been having a play on words. It would be an extreme coincidence that these guys came from such a short distance apart and yet came up with this sort of affinity."